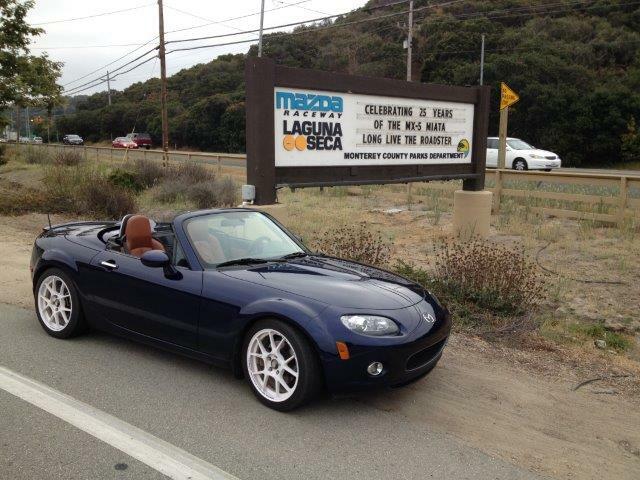 Congratulations to Richard on his selection as our Featured MX5 Miata! 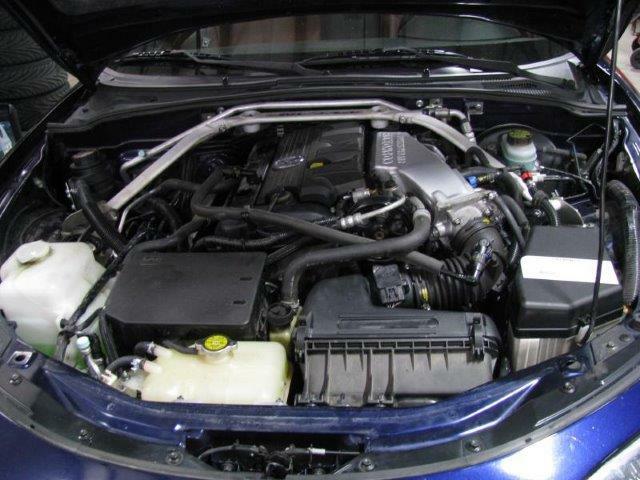 Having been quite content with my turbocharged Mariner Blue (still the best colour!) 1990 NA-model MX-5 Miata, when the NC-model MX-5 came out in late-summer 2005, I was intrigued, but not in any way motivated to jump ship. That changed when, in early 2006, Mazda unveiled the PRHT model in the new-for-2007 colour combination of Stormy Blue Mica with saddle brown leather. I was sold! My NA went up for sale immediately and I had a willing buyer within a month (always a worry with a highly modified car). When Mazda Canada Inc. (MCI) began listing the upcoming 2007 models on their website (quite quickly, taking advantage of the media hype behind the PRHT), Stormy Blue Mica was listed with two interior (and soft-top) colour options for the GT model (a first, given MCI’s usual practice of limiting Canadians to only one interior colour for leather, unlike the US-market where choices were offered), those being black and saddle brown leather (with correspondingly coloured cloth tops). I contacted my dealership – Weber Motors – and told them to order a Stormy Blue Mica GT model with saddle brown leather, inclusive of the Performance Package (LSD, DSC/TCS, and Bilstein shocks; standard equipment on the mid-level GS model). All I needed was confirmation of the order and my 1990 would be on its way. mail Greg Young. A groundswell of support came forth, to which, if you were one of those that helped, I thank you! 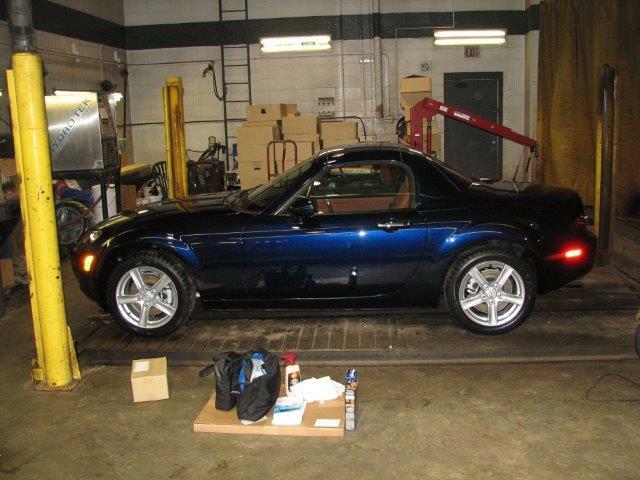 After more than six weeks having gone by with no news, I gave up, and ordered a few more go-fast goodies for my 1990 Miata from Flyin’ Miata (I was one of their poster children, having nearly everything in their catalogue of the day) as a means of protest. Come mid-September Brenda and I left on an Alaskan cruise and upon returning to work two weeks later, other than a few boxes of goodies from FM, I had an e-mail waiting for me from a Tony Harold of MCI; stating that MCI had reconsidered their position, and that a Special Order program was being established in which dealers with a bona fide client could special order a GT-model in Stormy Blue Mica with the saddle brown interior in either soft-top or PRHT form. Upon reading it twice, the gravity of my situation hit. I was ill-prepared for receiving exactly what I’d wished for and yet here was my cake being presented to me, and I’d be damned if I wasn’t going to eat it! I fired off a quick e-mail to the similarly disillusioned prospective buyer of my 1990, asking if he still wanted the car (now with a slightly higher price, based on the new, larger intercooler and other bits), and then called Weber Motors to get them to place the order. 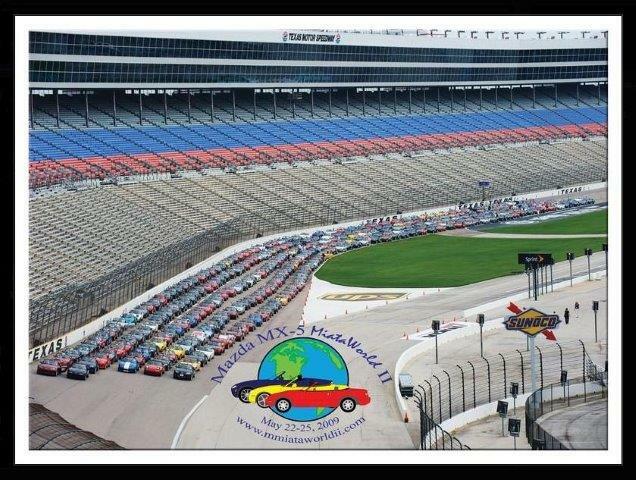 The good news was that my buyer was still willing, cheering up in the process himself, and I got slotted in as car #1 (for I knew about the program even before MCI had informed their dealer network). Dealer Principal Jerry Yuen, Sales Manager Richard Flannigan, and Business Manager Tom Panchuk, were all suitably impressed with what I’d accomplished; effectively re-tasking the production line to build a US model with Canadian wiring and gauges. Sale of my 1990 took place on Sunday, October 15th; a day that was near to the end of the driving season for a summer-only Miata (I did one winter with the turbo in 1997, which put a stop to the car being a year-round daily-driver). After owning it for over 13 years, and customizing it a lot, there was more than one tear shed as I watched it drive away. But, anticipation of my Christmas present kept me going. Preparations were made, with the purchase of a set of oem GX-model 16” wheels via eBay for the mounting of a set of studded Nokian Hakkapeliitta 4 winter tires, and pre-purchase of a set of WedsSport 17” wheels to mount autoslalom tires for the forthcoming spring. Before even seeing the car I already had eight more wheels and four tires for it! Yes, you could call me nuts…many do. 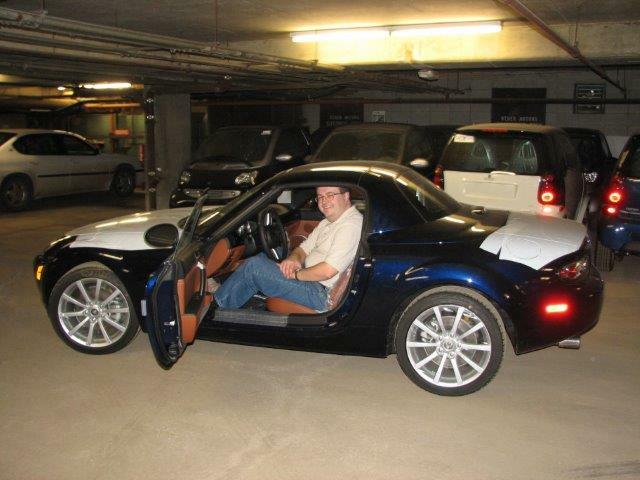 In early December I found out the date of arrival of my car, and there was one thing to check prior to giving the final nod on the car; that being available headroom, in so much as I knew that the PRHT had 10mm less of it as compared with a soft-top model (I’m tall for a Miata owner at 6’2”, though thankfully evenly distributed in terms of the split in leg and torso lengths). I’m not sure what I’d have done had I not fit, but I kept my fingers crossed. 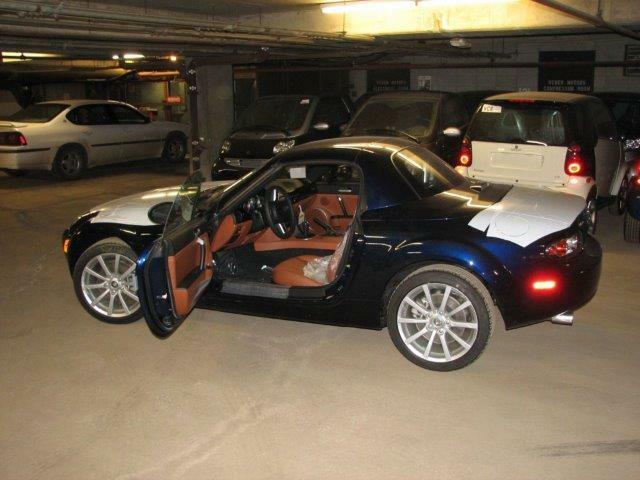 The first 2007 MX-5 PRHT delivered in Edmonton; a car that would ultimately become #1 of 16 Special Order PRHT cars for Canada. Snug, as a Miata should be, but I fit fine. The deal’s done, it’s mine! After a brief test-fit, I gave the nod, to which the deal was concluded, giving the dealership the go-ahead to have the 3M film, iPod connection, and front / rear mudguards installed, along with swapping the car over to my winter wheels/tires which I’d brought with me. The delivery date of December 23rd had now become a reality. I made arrangements with Tom Panchuk to pick me up on his way to work that morning, and with a bag full of wax and other car-care products in-hand (there was no way that the dealership’s guy was going to get his mitts on my car, and no way that it was going out into winter without two coats of wax) I was picked up and delivered to my car, which was awaiting me in the service bay, replete with its winter boots, waiting patiently to be caressed with wax. A nice bonding exercise as it were. I did find the car sans its mudguards however, and the all-weather floor mats were nowhere to be found. Taking that in stride for the time being, I began my wax job, getting to know the car intimately. Upon Richard Flannigan’s arrival an hour later, I had him search out the missing parts, and happily got to installing them myself once they’d been found. By 10am, with the car waxed, mudguards installed, and floor mats changed, the car was ready for its drive out into the weak December sunshine, and ultimately home – top down! 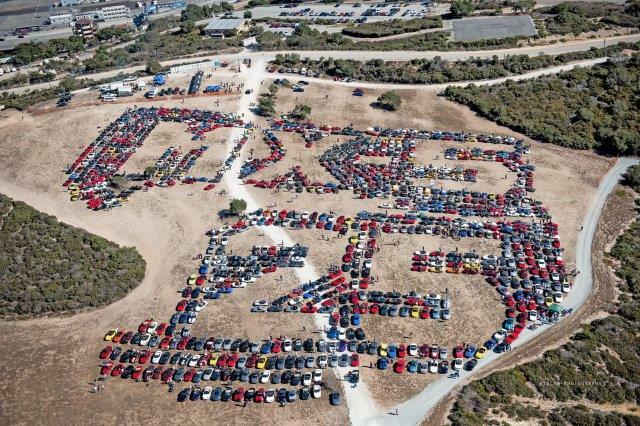 Richard Flannigan’s stylized photo of me preparing to leave the dealership. I finally got to drive, rather than ride along as passenger! 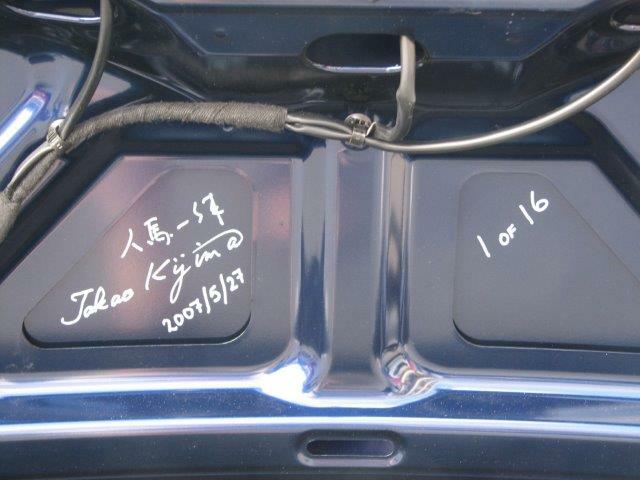 NA Chassis Engineer / NB & NC Overall Project Manager Takao Kijima of Mazda Motor Corporation signing my car; Peter Stellatos of Mazda Canada Inc. confirming its being ? 1 of 16 of the Special Order cars. The first step to addressing the problem, otherwise known as smuggling parts home after installing them to the car; installing chassis braces, cold air intake, and anti-sway bars with Keith Tanner before leaving FM. 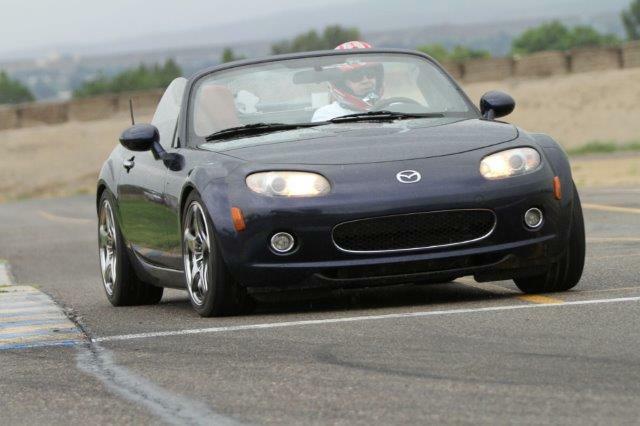 That’s better; sitting lower and far more stable after adding parts from Flyin’ Miata and Good-Win Racing; I consider this the high-water mark for my naturally-aspirated NC. 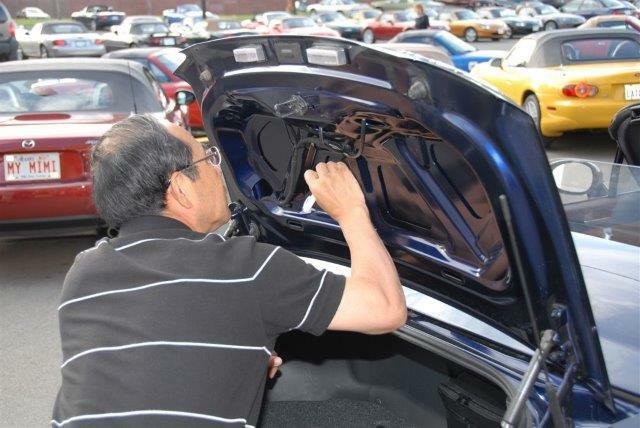 One of the Fathers of the Miata, Tom Matano, signing my car. 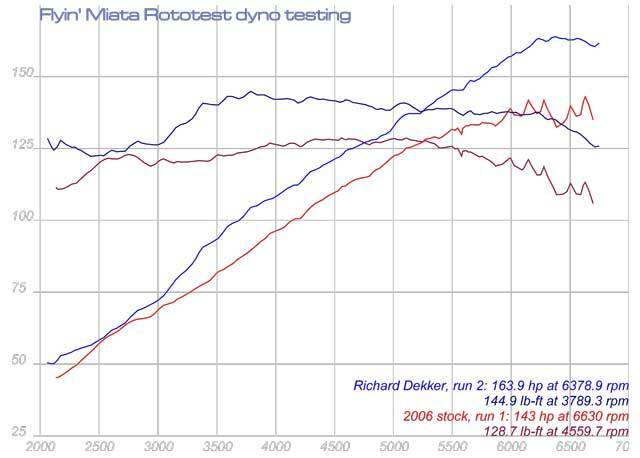 Stopping at Flyin’ Miata on the outward and homeward drive to Dallas, with a dyno graph to prove it; 164bhp & 145lb-ft at the rear wheels, a nice bump over bone stock 143 / 129 (the car now known as Nancy). 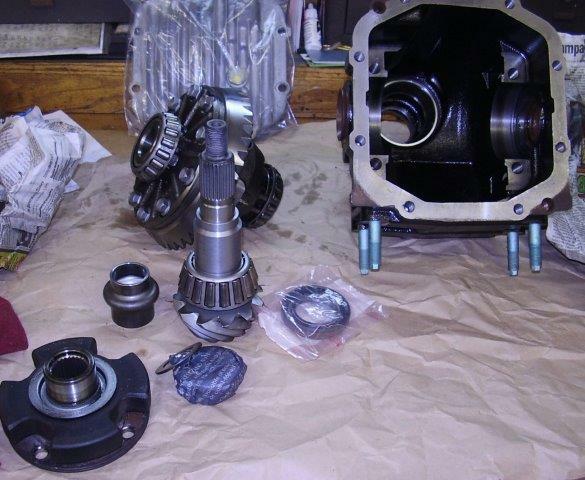 With my ultimate goal being the addition of a supercharger, I had a custom differential built in Florida, using cryo-treated / polished gears, a bespoke sleeve, and assembled by a differential master. 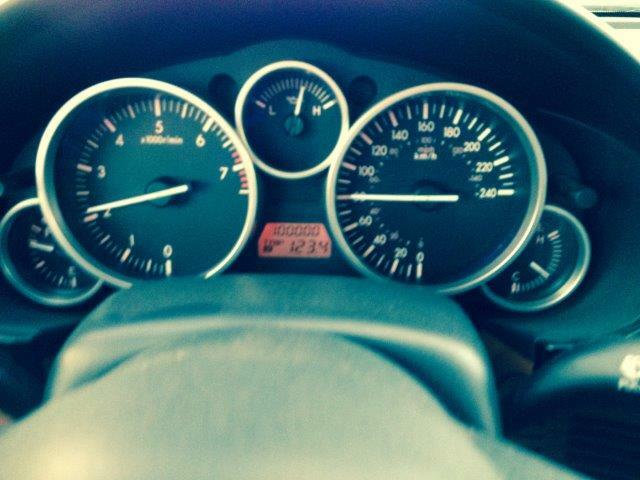 Fuel mileage bump was nice. Checked an item off the Bucket List; drove the infamous corkscrew. 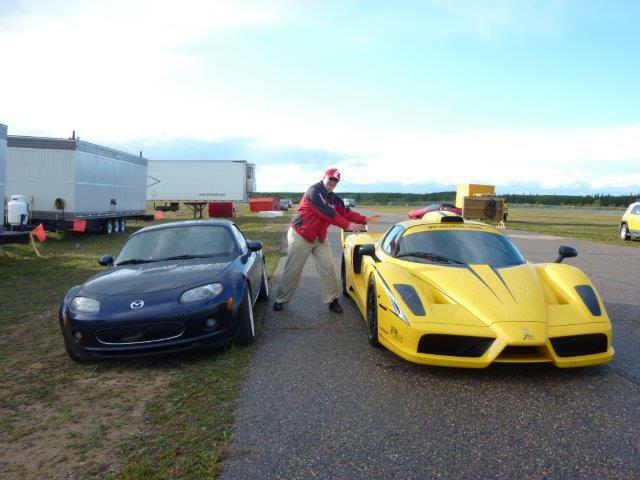 A paying instructor’s gig, and given the choice, yes, I would take the Ferrari Enzo. 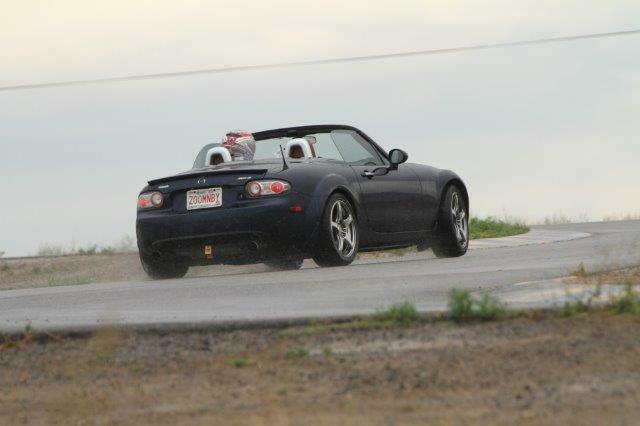 Spur of the moment trip down to Flyin’ Miata for a healthy dose of boost. 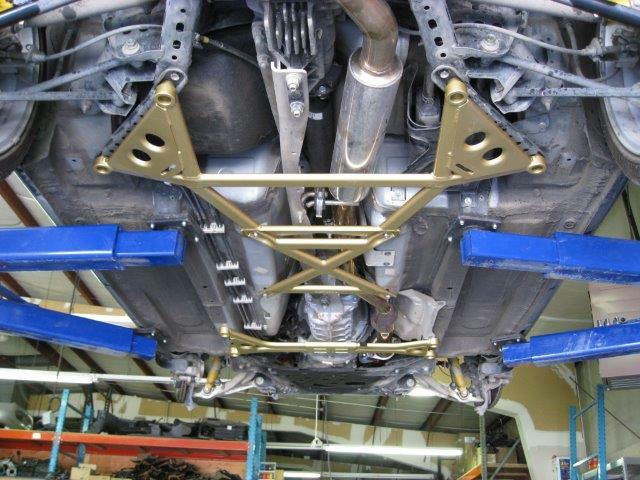 Now making 257bhp & 215lb-ft at the rear wheels, perfect pairing with the diff. 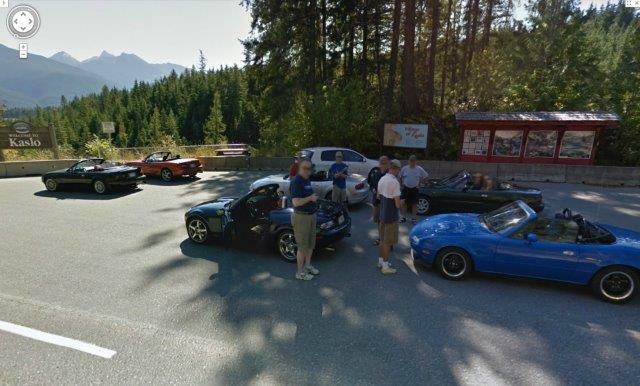 Nabbed by Google Streetview just outside of Kaslo. 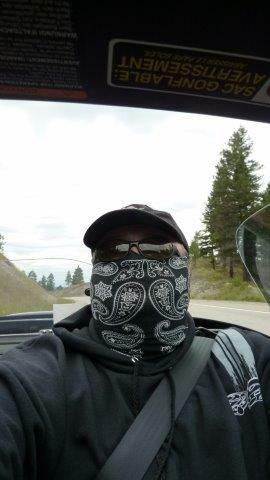 Committing crimes while masked; a selfie while crossing the 90,000km barrier. Tail-out in the rain on the damp track. Flat through the corners now…no more leaning (or falling over). 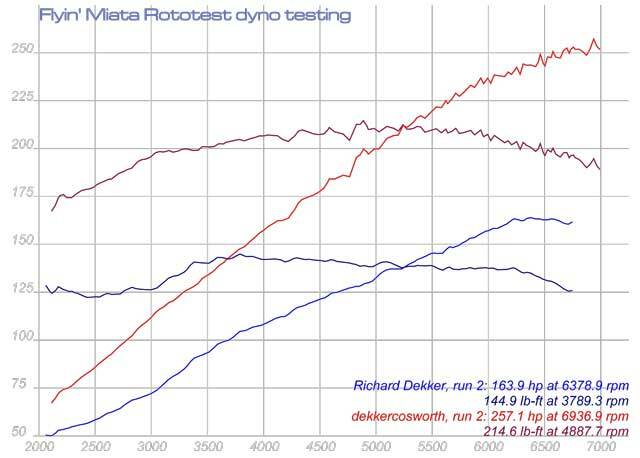 Joe McClughan of Dynotronics giving the ecu tuning a tweak; making even more power now. 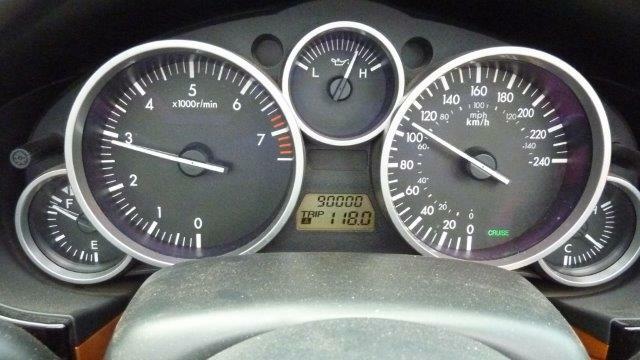 Crossing the 100,000km barrier after a wonderful road trip with many fellow club members. Good to see some old friends at the event too. 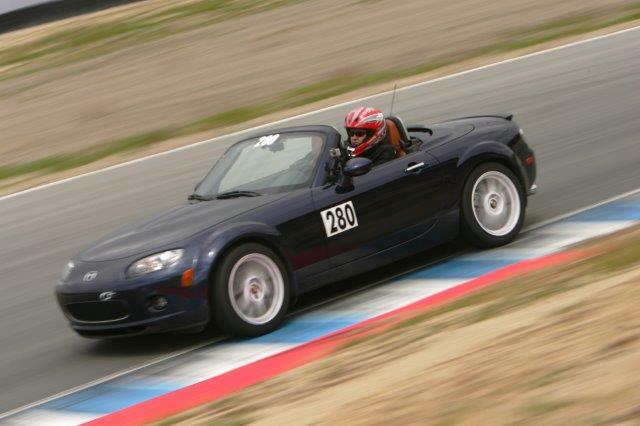 You might be wondering why I penned this ode to my NC; looking back at a little more than eight years of ownership (five less than my NA). But it’s come time and I’ve sold the car effective for March 2015. Where this leaves me I’m not quite sure. 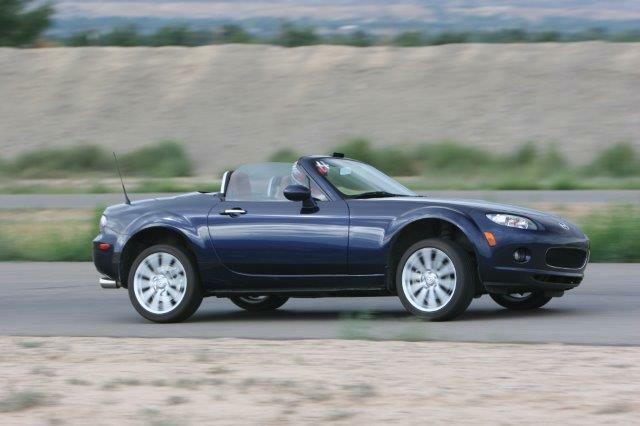 I’m not leaving the club, despite soon being without a Miata for the first time in 22yrs (or any Mazda for that matter in 25 yrs), and I will be hunting for the right replacement over time – be it a ND or the right NA – but for now I’ll be saving on the cost of sun screen. I wish new owners Adam & Nancy Cieply many fun memories with their new car. Cue the Rocky Horror Picture Show’s “Let’s Do the Time Warp Again” as background music, as I just bought a 1990 Mariner Blue Miata, returning to my roots of July 1993 when I purchased my first Miata. 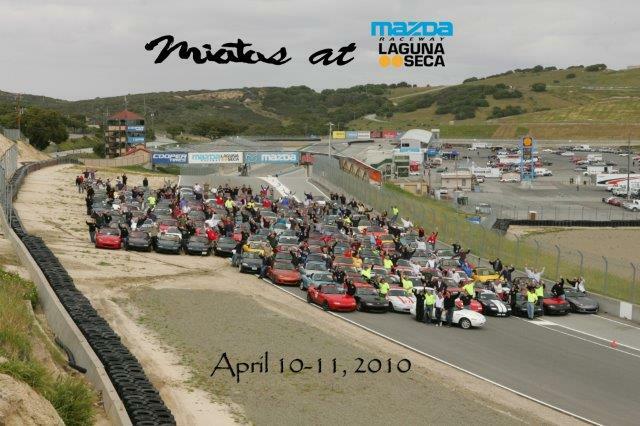 The specific Miata I now have first came into the club in March 1995 – just a few months after the club formed – through John & Jenny Koershuis, then changed hands to Des & Sheila King in September 1996. The Kings relocated from Stony Plain to Lethbridge in July 2010 whereupon they dropped their membership at the end of the year. Des traded the car in at Lethbridge’s Milestone Mazda in spring of 2014 and I actually considered buying it then, but it sold rather quickly. 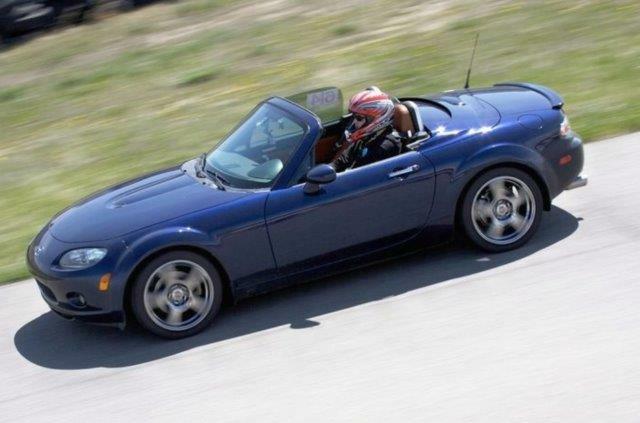 It recently popped up again in Medicine Hat at Southland Volkswagen, and having just concluded the deal with Adam on my 2006 NC, I was feeling sullen enough to be cruising the Autotrader app to find it late one night, and bang! Thank you to Steven Searle for helping me get to Medicine Hat in order to ferry the car back home on January 23rd, to Randy Stiles for picking up the ‘unicorn tears’ formula Motorcraft transmission oil via his Mustang club membership discount that day, to Martin Savill for the lend of his hard-top that same night in a rain storm, and to Gary Versteeg for making his hoist available so that we could change all the fluids the following day. 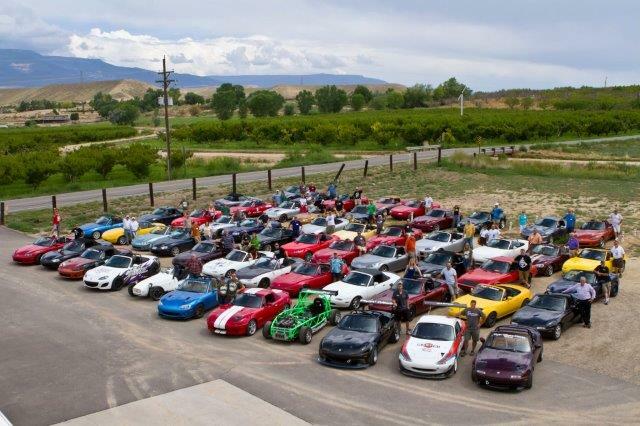 Okay, So Why Exactly ‘THAT’ 1990 Miata? I’ll offer a brief explanation, as you’re likely still puzzled by my recent purchase…as is my wife Brenda. For starters, Mariner Blue for the win! It’s still the best colour. California license plate blue (the colour sample sent to Japan by Bob Hall). French Racing Blue (the proposed name). It needs stripes though! Best of all, it’s never seen winter, ever (at least until I drove it home). It’s a totally rust-free NA; a rarity these days.